It is 1964: Bert Cousins shows up at Franny Keating’s christening party uninvited and notices a heart stoppingly beautiful woman. When he kisses Beverly Keating, his host’s wife, he sets in motion the joining of two families, whose shared fate will be defined on a day seven years later. If you enjoy stories that explore the nuances of big, messy, irresistible families, then this new novel from Orange Prize-winning author Ann Patchett is for you. Commonwealth is an immersive read that drops you right into the thick of one such family. The story opens on a stiflingly hot day in 1960s Southern California. Looking to escape his wife Teresa and their four children, Bert Cousins shows up uninvited (and with an unexpected bottle of gin in hand) to Beverly and Fix Keating’s christening party for their second daughter. When he develops a sudden passion for the hostess, he sets in motion the dissolution of both marriages and within a few years the Keating and Cousins children are spending their summers together in Virginia. 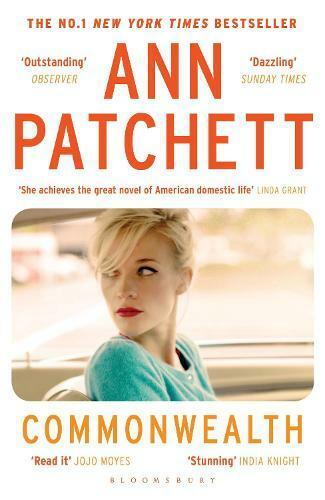 Patchett follows the two families over the next five decades, tracing the ways their lives fold into one another. The tangled relationships that develop between them all will likely be familiar to anyone who comes from a blended family themselves. While the novel’s narrative is fractured by continual shifts in time and perspective, the story largely circles around two key events that are inexorably entwined. One is a tragedy and the other is a book – a thinly-veiled fictional imagining of the former. Patchett poses questions about the stories families tell about themselves: how do they begin? What is their significance? And, what happens when the cracks in them are exposed? On a purely sentence level, Patchett is a delight. The novel’s tone is wonderfully matter-of-fact and wry, especially when the characters are at their most vindictive – the first time that Teresa is able to send the children to Bert without a chaperone she purposefully forgets a suitcase, ‘A bold manoeuvre she would never have attempted when Bonnie or Wallis was on duty’, and gleefully imagines him hitting the ground running. Highly recommended.